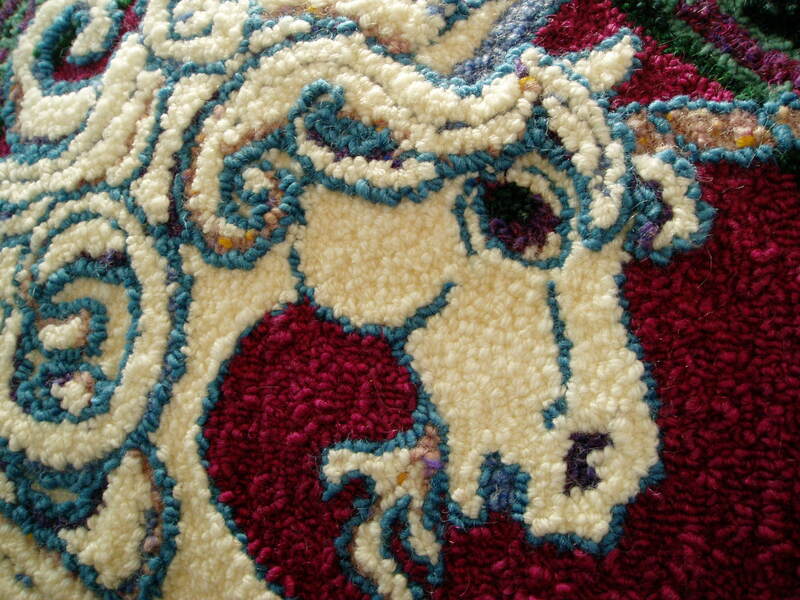 For the past year and a half, punch needle rug hooking has been a new fiber medium for me. After taking a one-on-one intensive session at the home studio of Amy Oxford (pioneer of the Oxford Punch Needle), I was soon poke-poke-poking wool yarn into a deeply textured pictorial form. Originating in eastern Canada and New England, rug hooking began with a crochet-like hook that was used to pull loops of cut fabric strips or wool yarn up through a coarse fabric to the front face of the piece–creating an effect not unlike a berber carpet. This process can be painstakingly slow and tricky to make all the loops the same height. Amy, who was punching rugs professionally, was eager to design a superior tool that not only would help her work faster but also with greater precision. She now supplies materials and instructions from her home in Vermont, but her student base reaches far beyond New England. She certainly has an avid fan now in Wisconsin! 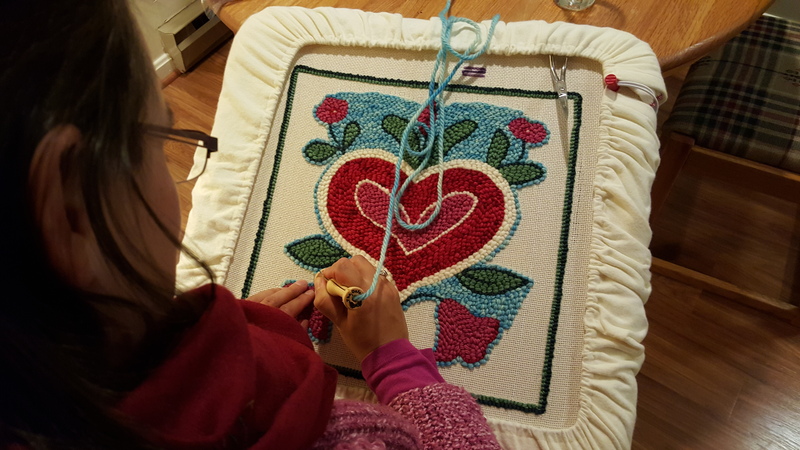 Since that first folk art heart with blossoms begun in that class, I’ve completed five additional pieces–some in the thicker rug style, others in finer detail with worsted and sport-weight yarns. My latest piece brought this new medium for me into the stream of my ongoing exploration into the narrative and symbolism of the unicorn. I started by drawing out the 16×16 inch design on paper, transferring it then to the monk’s cloth backing using our farm’s bakery case as a handy light table. This backing is then stretched tightly over the loom frame (shown above with the padded cover to keep the tension-providing barbs from poking my wrist). The backing should feel like a drum head when fully mounted. This high tension allows the punch needle to glide through the backing with minimal effort. 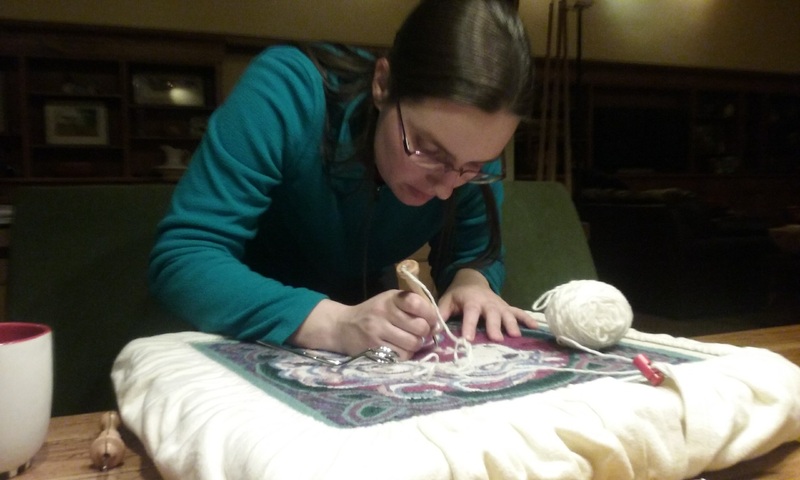 Not unlike the Gothic tapestries, punch needle rug hooking is worked from the back side of the piece. 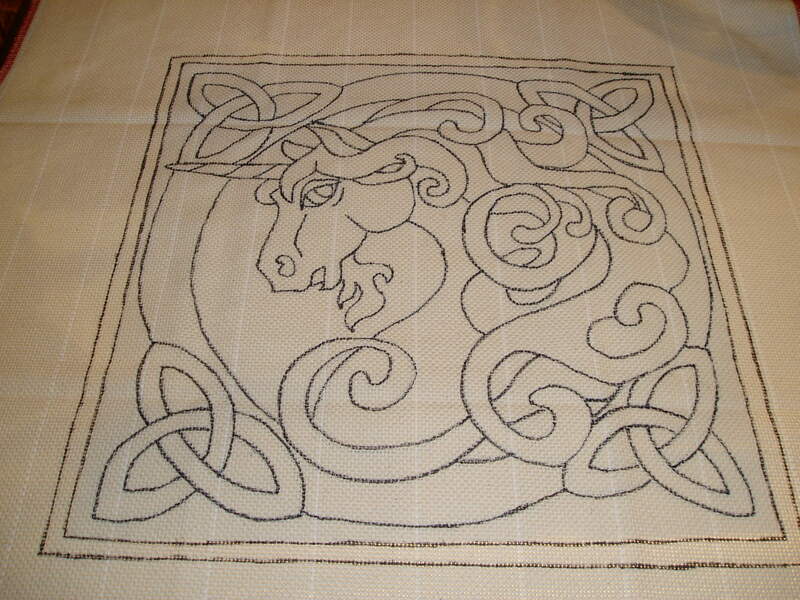 But completely unlike tapestry, you can start pretty much anywhere on the design. No methodical bottom-to-top process. Curves are graceful and natural, lending the medium well to pictorial designs. Outlines, I found, are a little tricky if you’re looking for a thin line, but they are more convincing than the stepped approach of tapestry. This is why it’s so fascinating for me to have fluency in many mediums–each have their strength and weaknesses. Each medium can take the same idea and say it so differently or, most importantly, one might lend itself better to the expression of the idea than another. Once the punching process begins, the piece comes to life with the colors and textures chosen. Woolen yarns work best, but I have used wool-alpaca, wool-mohair, and wool-silk blends with success as well. When blending or shading colors, the process is somewhere between theories you might use in embroidery and pointillist painting. 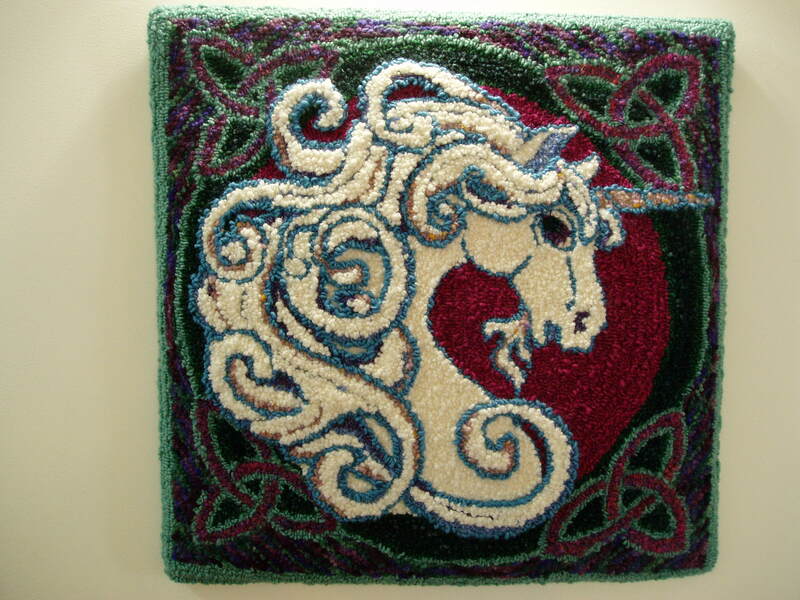 For this project, I was playing with a fusion of Celtic (the Trinity knots, deep greens and royal purples) with an Art Nouveau approach to the “bust” of the unicorn. The creature appears to be looking out from a portal–part joining us on this side, part obscured. It’s fitting for the state of the know and unknown elements of its story today. The mane is quite whimsical, which adds to its magical allure. For the background, face, and horn, I used the Oxford “mini” and for the mane the “mini with heels.” The heels version makes slightly longer loops, creating a more three-dimensional texture, which can be best observed in the detail photo. Overall, I love the sense of movement, of energy caught in stillness, and the overtones of royalty.